Long article from Timothy Wilken on synergetic wealth and synergetic consensus. 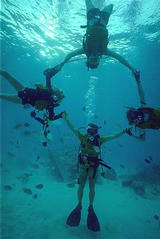 "If we humans synergically reorganized our world, we would all be wealthy beyond our wildest dreams. Today in 2002, if we were to reclaim the gift of all the land and natural resources presently held on planet Earth as individual property. And if we were to further reclaim the gift of Progress from those few who control it today, and then divided these two gifts equally among the 6 billions of us living on the planet, we would discover to our surprise and amazement that every man, woman, and child is wealthy beyond their dreams. There would never be any need for humans to earn their livings again. Our livings have already been earned by all those humans who lived and died to give us the great gift of progess. Then all humans would be free to spend their time making their lives meaningful by creating more wealth to be gifted to living and future humanity." And I agree. There's resources enough on this planet for everybody to live affluently, if those resources weren't squandered and hoarded so much. And the resources could be used in collaboration and in harmony with the planet, rather than in the adversarial relationship that exists now. But it would require a dramatically different way of thinking about things, and a dramatically different way of organizing ourselves. Timothy also talks about what he calls 'Unanimous Rule Democracy', which is very much how I think democracy should work as well. Not rule by the majority, not rule by a dictator, not rule by whoever is first or fastest or richest, but unanimous consensus. Which is something we don't see much of in our current society. "Synergic consensus is not availability to humanity today. We do not yet know how fast it will be at making decisions. But, I predict that unanimous rule democracy will prove faster than majority rule democracy. Synergic consensus elimates conflict. Recall conflict is the stuggle to avoid loss. Conflict is at the very heart of majority rule democracy. The focus of synergic consensus is very different. The entire group knows from the outset that they cannot lose. They are focused on choosing a plan of action that serves the needs of all the members in the group—to choose a plan of action that causes no one to lose. The synergic veto is not invoked capriciously. The only basis for synergic veto is to prevent someone from losing. This is a mechanism to eliminate loss—to choose the very best plan of action for everyone. This may well speed up the process of decison making. In any event regardless of the speed of decision, implimentation will be rapid. There is no conflict. This is a major advantage over majority rule democracy." I'm wondering how to demonstrate that, even on a small scale. More on that at another time. "My smmr hols wr CWOT. B4, we used 2go2 NY 2C my bro, his GF & thr 3 :- kids FTF. ILNY, it's a gr8 plc." "My summer holidays were a complete waste of time. Before, we used to go to New York to see my brother, his girlfriend and their three screaming kids face to face. I love New York. It's a great place." Teachers and parents would typically think it is a horrible thing, that kids can't read and write in normal ways, and it means that education is going down the drain. Maybe that's what it means, and maybe it is bad. But it is also worth looking at, that what is emerging is different forms of communication, that cultivate different types of skill. To read messages like those, you're not using the same linear literary and literal skills previous generations would use. Many things are happening by pattern matching. You figure things out, not by a standard interpretation, but by looking at the whole picture and guessing at what it might mean. I notice that kids today appear to have rather advanced skills in some areas that I didn't at all have when I was a kid. My 3 year old daughter seems to learn things by some kind of pattern matching osmosis, without necessarily going through the 'logical' steps of getting there. There's a thousand channels on our cable TV, and she's not really fluent with numbers over 10, but she'll quite easily surf around between the channels she likes. Just like she can operate a web browser quite well without being able to read. It is like the new generations are evolving some skills that allow them to deal with complexity without getting confused. Because they aren't trying to reduce everything to linear logic. Maybe that is a good thing. Extremely successful, much of it appears to be undeserved. We are totally dependent upon them, and there isn't much of an alternative. Becoming too successful in our niche simply means that we will attract their attention. We like it when we see them fail. We are uncomfortable when we see them fail because they just keep working at it until they get it right -- they will always be back. Unless, of course, it is determined to be an uninteresting market. They don't care about us. We are just a source of revenue. The quality of their products and support is only as much as absolutely necessary to keep us in the fold. We hate them, but if they offered us a job, we would join them in a second and gleefully begin to oppress our former colleagues." Hm, interesting comparison. Now, what is likely to bring Microsoft down into a more humble place is *Open Source*. What does that bring to the comparison? Will the American Empire fall, just like the Soviet Union did, because new technologies and spontaneous cooperation makes it impossible to block open communication, and much more desirable to be free to gather your own information and make your own choices? Maybe it is inevitable that a slow and centralized bureaucracy eventually becomes irrelevant. Even one that controls thousands of nuclear warheads, and the mass media, and the production facilities, and the banks. 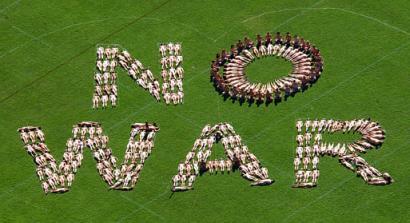 300 Australian women staging a war protest, by spelling out "No War" with their naked bodies in a Sydney sports field.